Spending their time in front of the mirror singing and dancing. After that picture taking naman :)! Yesterday, we spend our whole afternoon at the mall. My kids loves spending their weekends playing and shopping. Both of them are still at the age when they do need to much entertainment and attention, that's why to relieve some of their stress. I make sure that I always put them first. I spend any extra time with them. Going to a park or mall, watching Disney channel, reading books, cooking, anything just to make them happy. my boys love malling too. Check out my post, PBW : Buco. 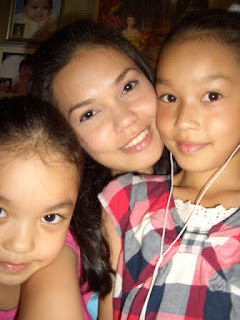 agree with momi chris n shydub, you looked like sisters lang.. you've got pretty daughters! Enjoy the rest of the week, and check out My PBW as well. you look so young to be a mom to those girls... parang magkabarkada lang kayo... which is great! Thank you for the compliment to my new page and grabbing my new badge! My kids love malling too.Nakakaloka pag sila ang kasama nonstop hehe.I like the first photo Jac ang cute nila Kei chan & Rio chan mana sa yo. oiiist sis parang batang bata pa looks mo hehehe, mukhang magkakapatid lang kayo nin rio hehehe.. My pixel bug is at nostalgic blog..
Ilang taon na kids mo sis?